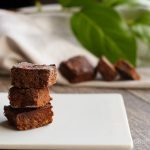 A dairy-free, gluten-free, refined-sugar free chocolate date fudge slice that is so yummy and less than 50 calories a piece. 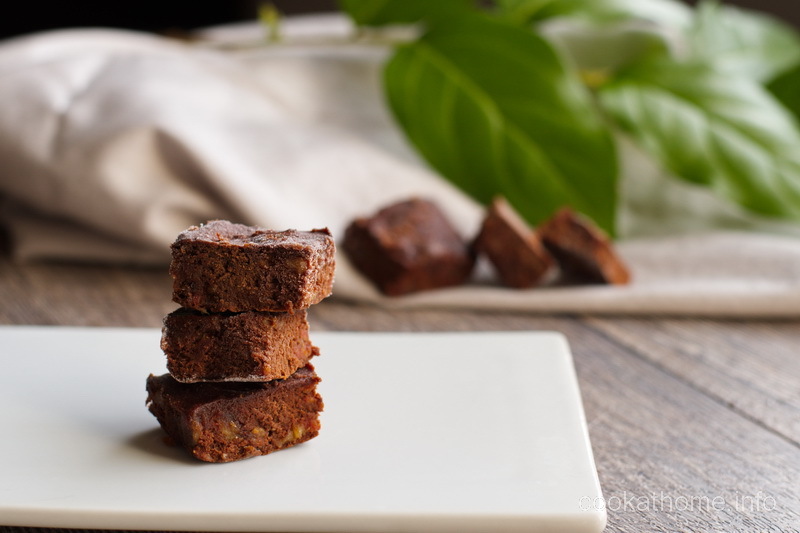 A dairy-free, gluten-free, really yummy chocolate fudge, using only 4 ingredients. And all of them natural. So this is healthy … and at less than 50 calories each, you can have two or three pieces for what you would usually eat from other brownies. You can’t really taste the pumpkin in this, but it does an awesome job of being an oil substitute. The first time I made this, I added some chopped walnuts to the fudge, and topped off with my never-fail healthy frosting (recipe here). I wasn’t too sure about the taste, or the texture, so I put it in the freezer. This made it really easy to slice into pieces, and as one of my taste testers said (yes, this is you Jessica), it tastes nice and cool, not crumbly at all. I think I have found my new favorite brownie recipe. And we love eating it straight from the freezer – or maybe that’s just us being weird? Process the dates until a paste is formed, then add all other ingredients. Spoon or pour into a lined 8x8 baking pan and bake for 25-30 minutes (until a skewer inserted in the middle comes out clean). Allow to cool to room temperature and store either in refrigerator or freezer prior to cutting into pieces. A must try for me since I love pumpkin whether you can taste it or not, chocolate will do for me too! You have to try it – trust me!